"These findings are unexpected because evolutionary theory predicts that a population should adapt quickly to a stressor like this and become less sensitive to it, not more sensitive to it. It is difficult to explain the results of this study," said Rogalski, a postdoctoral researcher in the U-M Department of Ecology and Evolutionary Biology. Microscope image of a 4-day-old Daphnia ambigua crustacean, like those used in a new study of evolutionary responses to heavy-metal contamination in lakes. 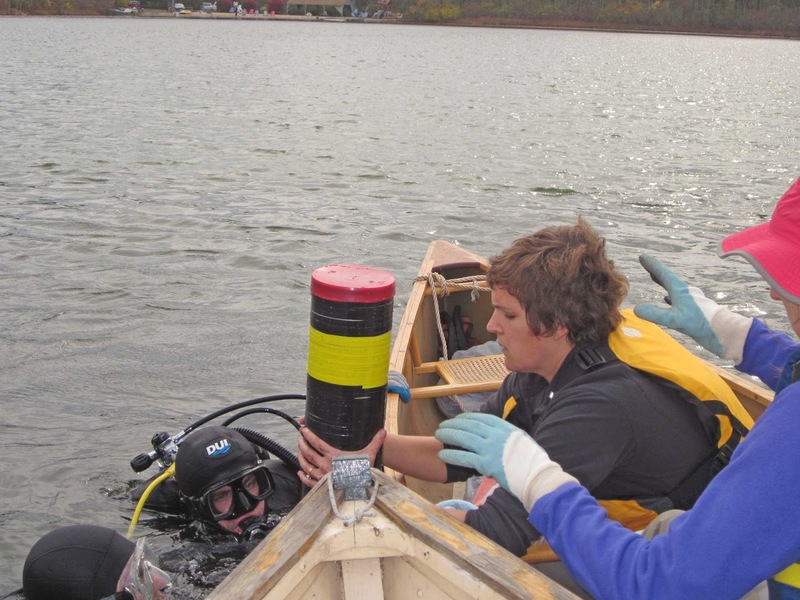 Scuba divers hand a coring device containing lake-bottom sediments to U-M biologist Mary Rogalski at a Connecticut lake. Scuba divers collected 5-inch-diameter sediment cores from the lake bottoms. Rogalski then estimated sediment ages based on the presence of radioactive materials and measured concentrations of copper and cadmium in the layers back to the late 1800s. In the lab, Rogalski isolated dormant or "diapausing" Daphnia ambigua eggs from various dated sediment layers, then hatched and raised them. She measured Daphnia's changing sensitivity to copper and cadmium by exposing them to various levels of the metals in glass flasks and determining the median lethal concentration. "It is difficult to know what mechanisms are driving this evolutionary pattern," Rogalski said. "Even so, this research suggests that we need to do more to uncover both the drivers and implications of maladaptation in nature." Paleolimnology is the study of ancient lakes from their sediments and fossils. The branch of experimental paleolimnology that Rogalski used in this study has been dubbed "resurrection ecology" by its practitioners. Diagram showing steps in a study that combined "resurrection ecology" with an analysis of dated lake sediments to examine evolutionary responses to heavy-metal contamination over the past 75 years. Maladaptive outcomes are less common than adaptive one and are less studied. In many cases, it is impossible to examine a population's response to a stressor over multigenerational timescales without conducting a long-term study that could take decades to complete. 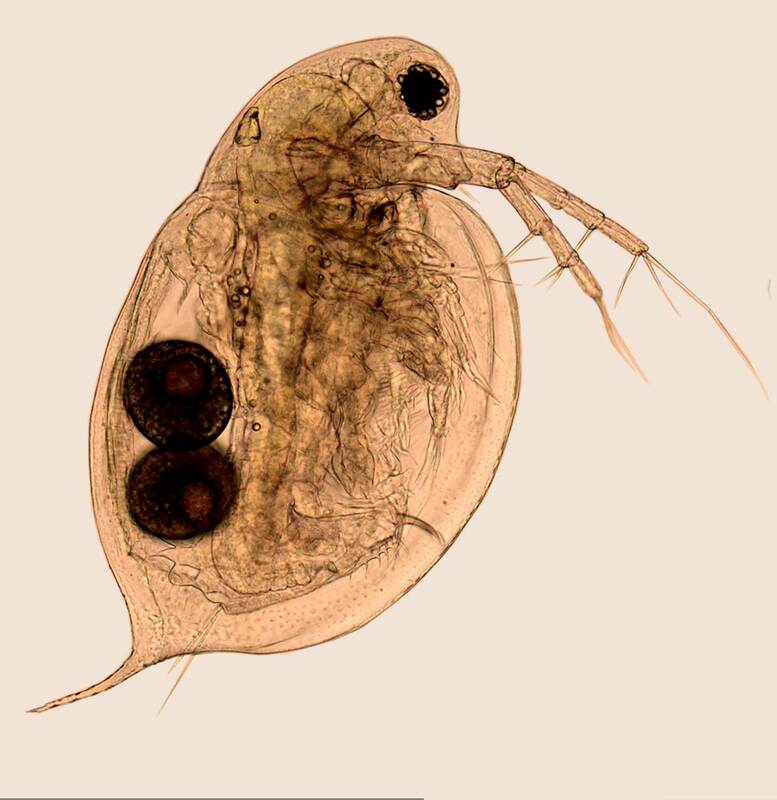 "Daphnia offer a system where examining historic evolutionary trajectories is possible," Rogalski wrote in The American Naturalist. 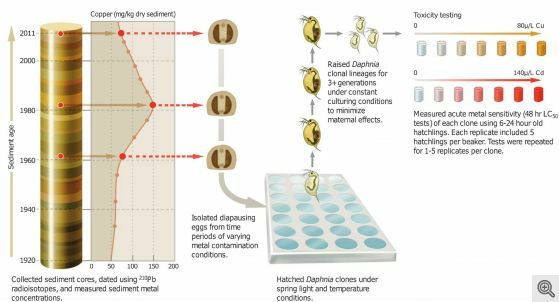 "Hatching diapausing eggs from dated lake sediments and culturing clonal lineages in the lab allows us to examine how populations change through time and the genetic basis underlying those changes."